Why Should You Accept Credit Card Sales? Nowadays most people don’t carry cash, and fewer people are writing checks. To make it convenient for your customers, you will most likely need to accept credit cards as a form of payment. Credit card processing companies offer this service, for a fee of course. The fees charged vary across merchants so you want to do your research before you sign up for an account. Be sure to read our article on best credit card processors for a comparison of top providers. We have done a lot of the leg work for you. What are the Benefits of using an Intuit Payments Account? Since Intuit Payments is integrated into QuickBooks, your accounts and financial statements are always up-to-date. By simply clicking a Pay Now button on their emailed invoices, your customers can make payments online. You are able to accept payments on the go. By using the QuickBooks Online Mobile App, you can accept a payment from your mobile device. Payments are deposited to your bank account on average within 2-3 business days after the transaction date. 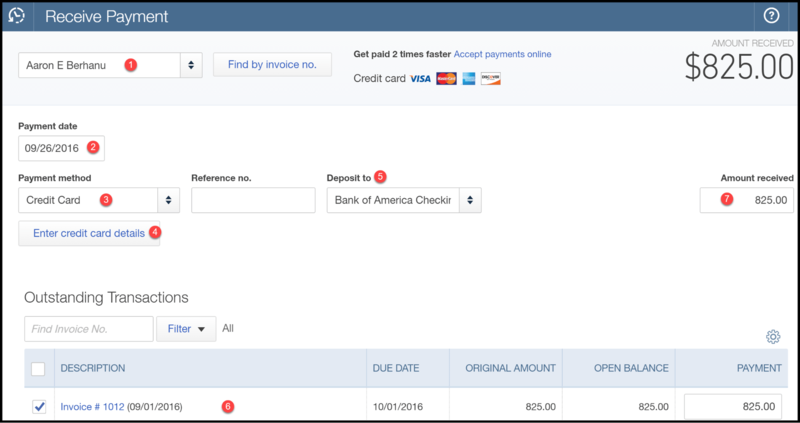 How Do I Record Credit Card Payments from Customers in QuickBooks Online? If a customer pays you immediately, you would record a sales receipt. However, if you have a credit sale, which means that your customer pays you sometime in the future, then you want to record an invoice in QuickBooks. Let’s begin with the sales receipt. From the Home page, click on the plus sign at the top as indicated below. Below the Customers column, select Sales Receipt as indicated below. The create sales receipt window will display. Complete the fields as indicated below. Billing address: This field will autopopulate with the information that is in the customer profile. In the how to set up customers lesson, we walk through step by step how to set up your customer info. Sales Receipt date: This should be the date that you made the sale. Payment method: Select credit card from the drop down. Enter credit card details: click ‘enter credit card details,’ and the following window will display. 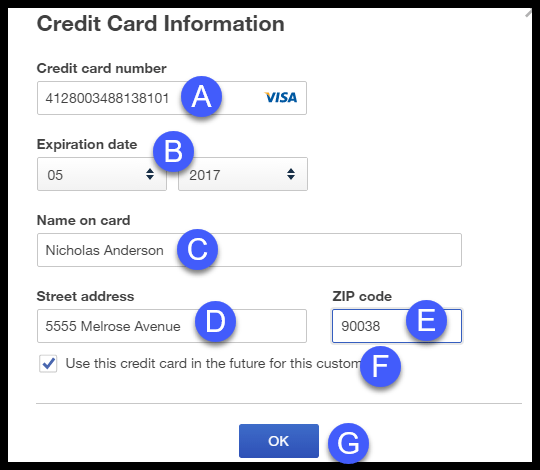 Complete the fields with your customer’s credit card info as indicated below. A. Credit card number: Enter the 16 digit credit card number. 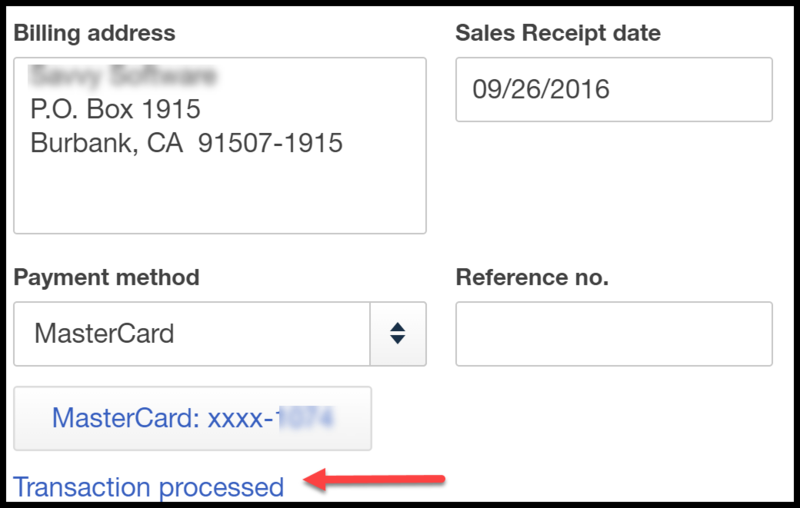 QuickBooks will automatically indicate the type of card (i.e. Visa, Mastercard, American Express) after you enter it. B. Expiration date: Enter the month and the year that the credit card expires. C. Name on card: Enter the name as it appears on the customer’s card. D. Street address: Enter the billing address for the credit card. E. Zip code: Enter the zip code for the credit card. F. Check this box if you want to keep this credit card information on file for future payments. G. Once you have entered all of the information, click OK to return to the sales receipt form. Deposit to: This is the bank account that you want this credit card payment to be deposited to. If you want to change the account, you can do so in this screen. TIP: To ensure all credit card payments are deposited into the right account, go to the How Do I Record Credit Card Deposits in QuickBooks Online section of this lesson. Product/Service: Select from the drop down the product/service sold to your customer. Description: This field will automatically populate based on the info for the product/service. You can also type a custom description directly in this field. Quantity: Enter the quantity, if applicable. Rate: This is the cost per product or service. This field will automatically populate based on the setup of the product/service. You can also type a rate directly in this field. Amount: This field will automatically calculate by multiplying the quantity times the rate. Message: You can type a message that will appear on your customer’s sales form. Amount received: This is the amount that will be charged to your customer’s credit card. Balance Due: This is the balance that will be due after the credit card payment is processed. 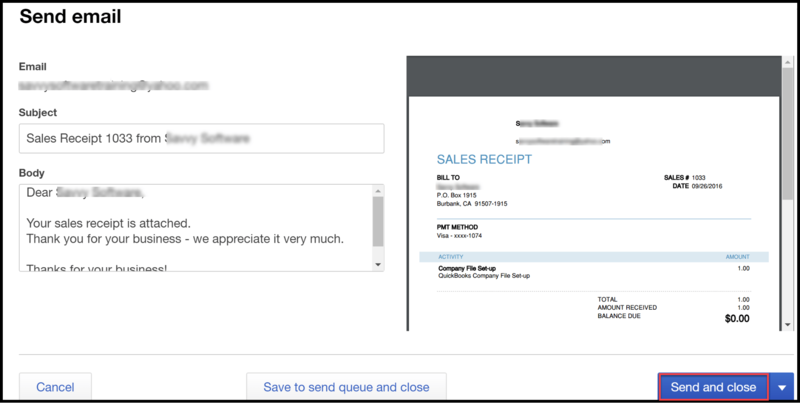 The send email window will open so that you can review the email that your customer will receive along with a PDF copy of the sales receipt as indicated below. Once you have made any necessary changes, you can click the Send and Close button. The credit card payment will be processed and the sales receipt marked as paid in QuickBooks.TIP: If the credit card is declined, you will see a message pop up on the screen to indicate this. 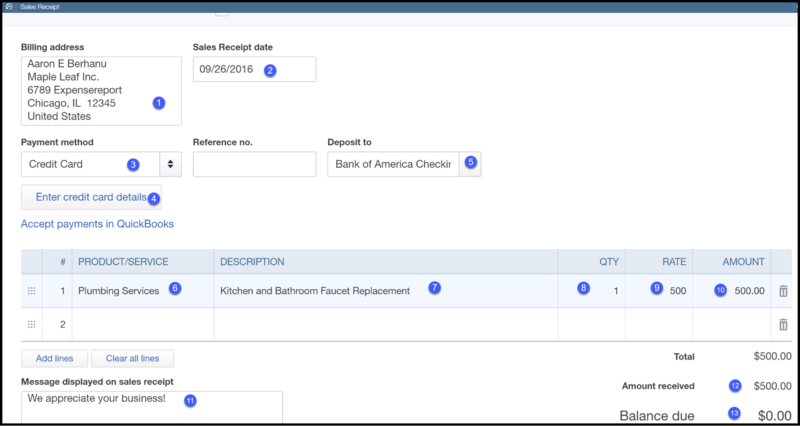 QuickBooks will allow you to save the sales receipt form. Once you receive another method of payment from your customer, you can come back to the sales form and enter the new credit card information. Navigate back to the Sales receipt, and click on the Transaction processed link as indicated below. 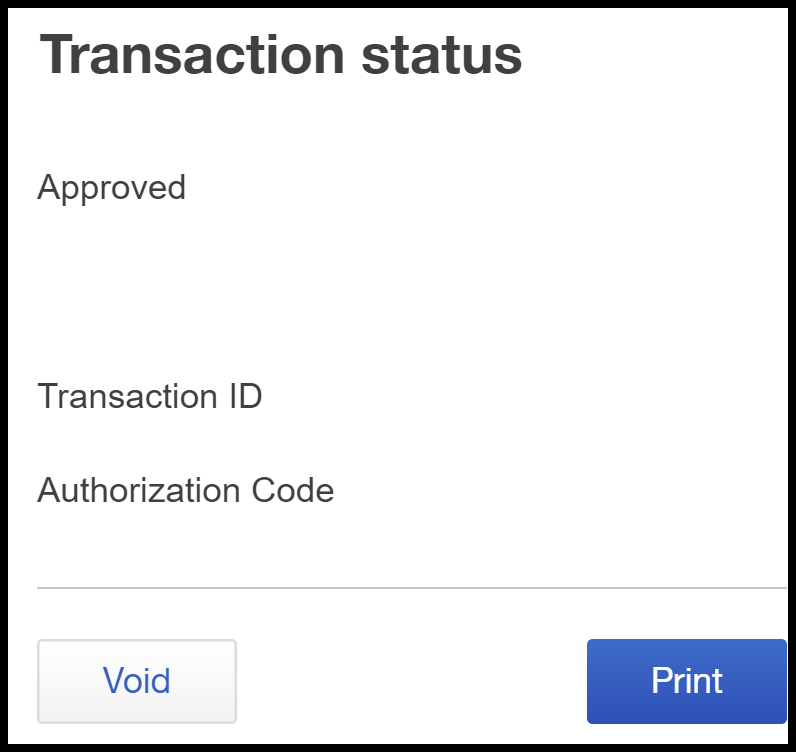 Confirmation that the credit card was approved and the option to Void or Print the transaction are indicated below. Now, let’s go through the steps to record a credit card payment on an invoice. You would use this method if your customer will pay sometime in the future. Below the Customers column, select Receive Payment as indicated below. The receive payment window will display. Complete the fields as indicated below. Customer Name: Select the customer from the drop down. Payment date: Select the date that your customer is making the payment. Enter credit card details: Enter your customer’s credit card information. Deposit to: Select the bank account that the credit card payment should be deposited to. To change the account, you can do so from the drop down. To set up a default account for all credit card payments, refer to the How do I record credit card deposits section of this lesson. Select the invoice(s) that the customer is paying. Enter the amount to charge the credit card. The payment will be saved, and the credit card payment will be processed. TIP: If the credit card is declined, you can still save the invoice. Once you receive another method of payment from your customer, you can come back to the invoice and enter the new credit card information to process the payment. Navigate back to the Invoice for confirmation that the credit card payment was approved & applied to the invoice correctly as indicated below. How Do I Record Credit Card Deposits in QuickBooks Online? Once you have processed credit card payments in QuickBooks, the next step is to record the deposit of those payments into your bank account. Depending on the type of credit card (M/C, Visa, Amex), payment may not show up in your bank account for several days. However, when it does, if you have an Intuit Payments account, it will automatically appear in the account that you selected when you set up your Intuit Payments account. Follow these steps to verify the account that credit card deposits will be categorized in. Click on the Gear icon located to the left of your company name, and select Account and Settings as indicated below. Step 2 – Click on the Payments tab on the left as indicated below. This is where we will record credit card deposits: the bank account that appears in this field is where the credit card deposits will be categorized in QuickBooks once the bank has made the deposit. To change the account, just click the pencil icon to the right of the field (show in the screenshot above). If you have not set up an account to track credit card deposits, we walk through step by step in our chart of accounts lesson how to do this. How Do I Record Credit Card Processing Fees in QuickBooks Online? Follow these steps to verify the account that credit card processing fees will appear in. Click here to read our guide to credit card processing fees. Click on the Payments tab on the left as indicated below. This is where we will record credit card processing fees: the account that appears in this field is where the credit card processing fees will automatically be categorized in QuickBooks once they have been deducted from your bank account. To change the account, just click the pencil to the right of the field (shown in the screenshot above). If you have not set up an account to track credit card processing fees, we walk through step by step in our chart of accounts lesson how to do this. That wraps up the section on How to Manage Credit Card Sales with an Intuit Payments Account in QuickBooks Online. The next lesson in our QuickBooks Online Training Course will be How to Manage Credit Card Sales with a 3rd Party Credit Card Processor in QuickBooks Online. In this course, we will walk through how to record payments, deposits, and credit card fees in QuickBooks Online if you use an outside merchant services provider. I’m new to QuickBooks, I’m using QBO Plus version. I invoice customers monthly for a service we provide. If the customer chooses to pay the invoice by credit card I get an email saying a payment has been made and the funds will show up in my bank account within 2-4 days. At this point my a/r has decreased, my undeposited funds has increased. The invoice says paid, not deposited. I haven’t entered anything. A few days later the deposit is posted to my bank account and i get a transaction I “match” to Quickbooks. Now my Quickbooks balance matches my bank balance. But, my undeposited funds balance has not decreased and my invoice still shows paid not deposited. What am I doing wrong? I think the issue might be with your settings. You can select a default account for all customer payments to record to. It should generally be the bank account that you plan to make the deposits to or the undeposited funds account. If you do set up all payments to accumulate in the undeposited funds account, you will need to match up the actual deposit to the corresponding undeposited funds transaction to clear both accounts. To verify which account your payments are set to record in, go to Settings, click on the Payments tab. In the Recording accounts section, it will say “Where should we record Payments Deposits”. Make any necessary changes that you need to. Also, your invoice will never say “deposited”. However, the “paid” status is the correct status for an invoice that you have received payment for.